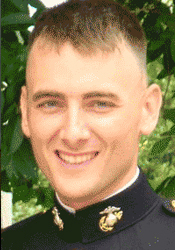 Lt. Robert M. Kelly was assigned to the 3rd Battalion, 5th Marine Regiment, 1st Marine Division, I Marine Expeditionary Force based in Camp Pendleton, California, at the time of his death in Afghanistan, November 9, 2010 Kelly was commissioned in the Marine Corps on Dec. 12, 2008. It was his third combat deployment. He had a distinguished military career. His personal service awards include the Purple Heart, Combat Action Ribbon, Navy and Marine Corps Achievement Medal, Marine Corps Good Conduct Medal, National Defense Service Medal, Global War on Terrorism Service Medal, Global War on Terrorism Expeditionary Medal, Humanitarian Service Medal, Iraq Campaign Medal, Afghanistan Campaign Medal and Sea Service Deployment Ribbon. Please list the name of the runner you would like to support. Unable to load the reCAPTCHA image. The public key (6Lc--g4TAAAAANGf2gPLIef6AX51Bt51k851Fm7R) might be invalid for this domain.